Namibian-German artist Max Siedentopf has set up a solar-powered sound installation in the coastal Namib Desert to play the soft-rock classic on a loop. He has chosen an undisclosed spot in the desert to set up six speakers attached to an MP3 player with the single track on it and promises that it will run ‘for all eternity’. Good luck having it play for one year. The heat and the sand… won’t last long. Come on it’s a cool idea. We don’t have to burst every BAU bubble we find. 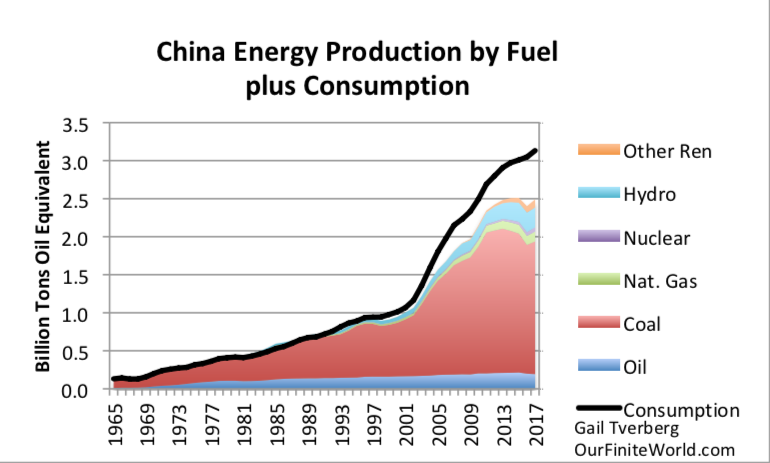 It is difficult to know how to interpret some of China’s fuel statistics. Some of China’s record crude oil imports were used to fill up strategic reserves, including at new storage sites in Jinzhou in the north and Huizhou on China’s southern coast, meaning they did not reflect actual end-user demand. Additionally, independent refiners increased their overseas orders at the end of the year to use up their annual import quotas received from the government for 2018. But that meant they produced more fuel than even thirsty China can absorb, triggering record exports of refined products as refiners offloaded surplus fuel. Great term: social implications. What would be some less euphimistic equivalents? Anyone want to venture a guess? There seems to be a phrase going round business circles in China: ‘What is coming will be as hard and as real as Winter’. Do we then all catch a cold? Or will it be pneumonia? There was a hurry-up to produce before tariffs were expected to hit Jan 1 (but Chinese reported data did not show this jump in economic growth). Now there is a cutback in orders, because the pipeline is already full. With less overtime, workers will have less to spend, going forward. Doesn’t sound good for the economy! It looks like China was slowing before the tariff’s were even talked about. I agree that China was slowing before the tariffs were even discussed. 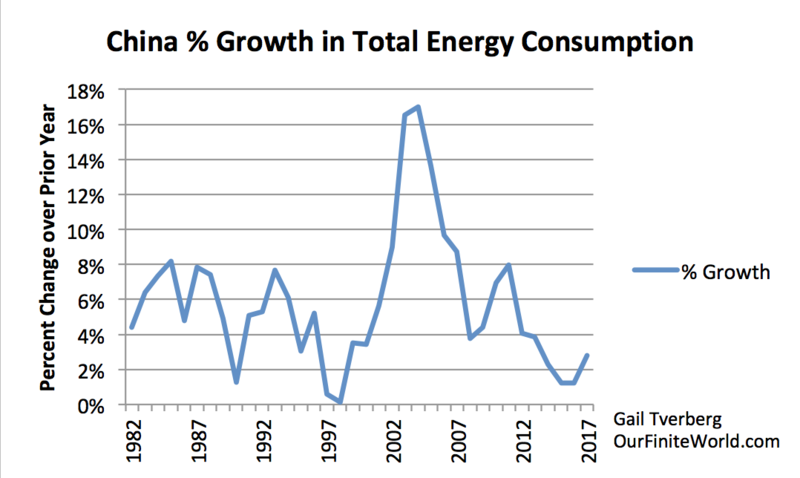 China’s growth in energy consumption scaled back after 2011. In fact, its scaled back again in 2014 and 2015. In recent years, China has likely been giving us a falsely high view of its economic growth rate. 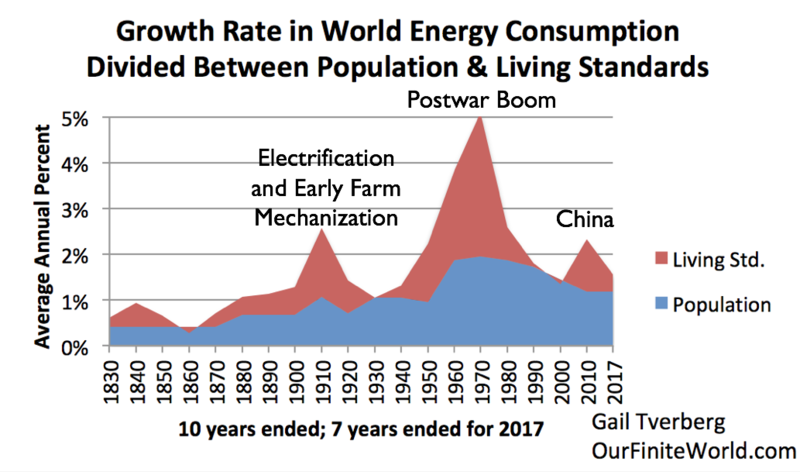 If we think about the situation, China’s growth in energy consumption ties in very much with the trend in world oil prices. 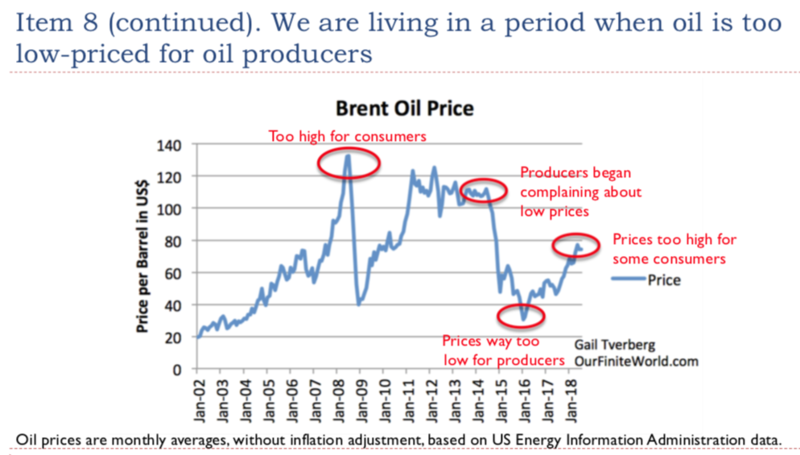 The run up in China’s demand was a major factor in the oil price spike in mid 2008, and the second lower peak in 2011. 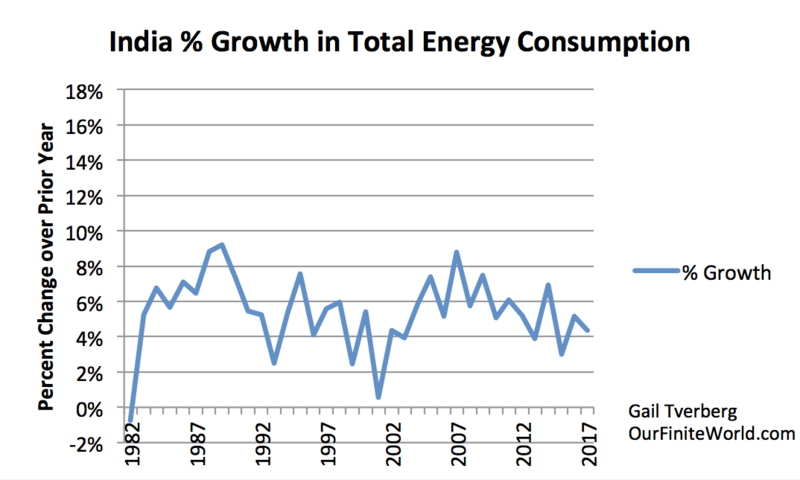 China’s drop off in energy consumption corresponds with the trend toward lower oil prices recently. China’s growth seems to have been lower for a long time. 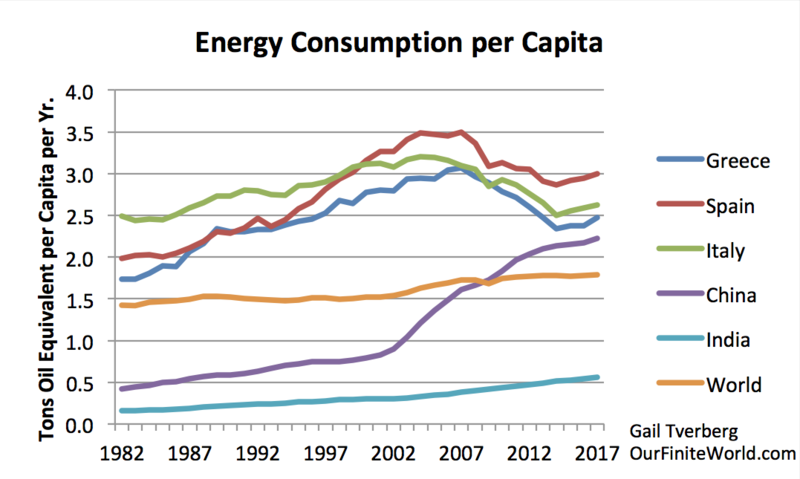 India is quite a bit smaller than China in terms of energy consumption. It shows a somewhat similar but smoother pattern. 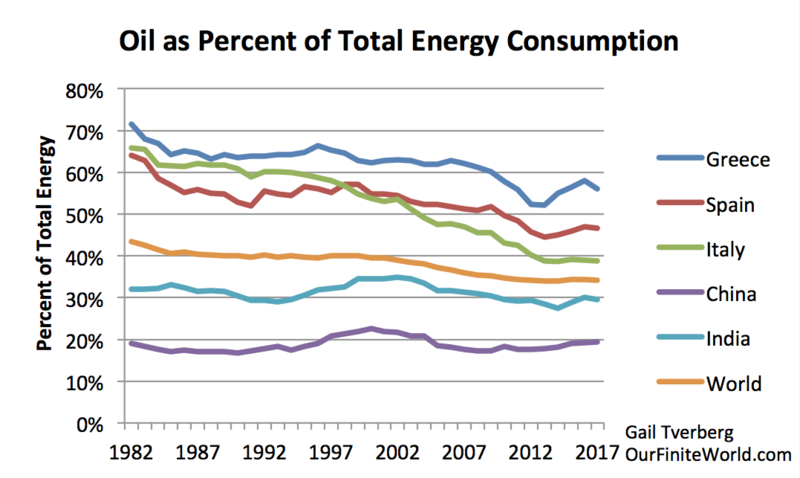 Its energy consumption growth is also slowing. Food is a commodity like oil. We don’t hear consumers asking for higher food prices to help out farmers around the world. In parts of the world where some people spend half of their salary on food, raising prices would be very difficult. The prices of vegetables have fallen in the last couple of months. For exmaple, onion prices have gone down from Rs. 70/kg to Rs. 20/kg…tomatoes have gone done from Rs. 80/kg to Rs. 40/kg…green peas from Rs. 60/kg to Rs. 25-30/kg. I can see that farmers would quickly starve if they needed to live within this new pricing regime. The people transporting and selling those goods probably aren’t too happy either. “South Korean exports, a data set often held up as a bellwether for the health of the global economy, fell off a cliff in January, pointing to a troubling slowdown in global trade. “Exports from the east Asian nation dropped 14.6% year-on-year in the first 20 days of 2019, according to data released Monday morning. That compared to an increase of 1% over the same period in December. “”We had expected a contraction, but the extent of the fall was a surprise,” Freya Beamish, chief Asia economist at Pantheon Macroeconomics, wrote in an email. “The global economy is weakening at a faster rate than expected, with the International Monetary Fund (IMF) warning the world is at risk of a sharp downturn… The report warned of a number of flashpoints that could lead to even lower growth trajectories across the world. “In every region of the world, more CEOs than last year now believe global economic growth will decline over the next 12 months. I am surprised that the new higher share of executives who are expecting slowdown is only 29%. This is up from 5% a year ago. I suppose it is hard for people to change views quickly. Just curious. How much do you think the ‘chief Asia economist’ at Pantheon gets paid and how long will she keep collecting that salary after the cargo ships stop? The Yellow Vests protest is spreading as I predicted. They are now protesting albeit peacefully for “now” in Germany. “The founder of a movement to unite Germany’s left wing has said it will take to the streets in 2019, inspired by the gilet jaunes protests in France. Mark my words, this movement will go global. It’s nothing more than people waking up to the fact that it’s the Plebs vs The Elite. 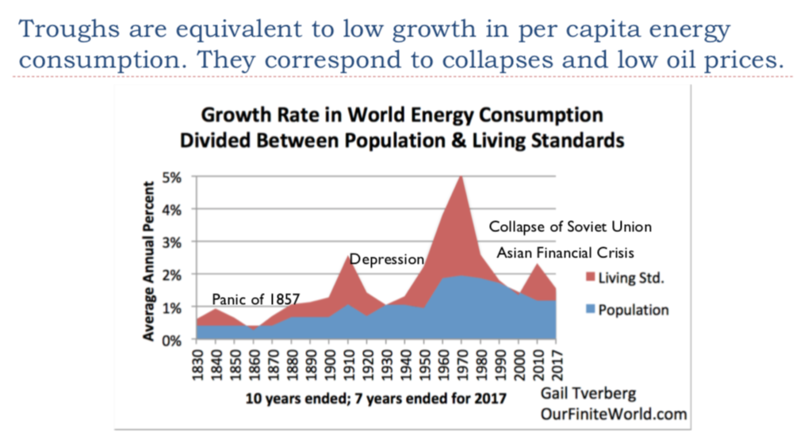 The underlying factor the movement doesn’t understand is that the global economic system is slowly collapsing and for now it’s happening at the periphery. It may very well do. Holland, Belgium and the UK have already seen yellow vest protests. A high-vis jacket is a cheap, highly visible (obviously) and easily obtainable badge of protest – an excellent idea. And it is oddly fitting that the French, with their history of setting global fashion trends (and indeed their history of popular insurrections), should be at the forefront of the movement. Wake me up when they effectively blockade IC infrastructure.. and or humiliate govs/CBs enough to assemble in some remote protected areas sending envoys and/or paratroopers into blocked installations and gov/office hubs. Obviously not there by a long shot.. The gilets jaunes have already forced Macron, humiliatingly, into making economic concessions, the cost of which will cause France to overshoot the European Union’s budget deficit ceiling next year. And the movement has become a rallying point around which the frustrations of disenfranchised populaces can coalesce. Those frustrations are only likely to worsen from here on as the economic situation deteriorates. I don’t think we should dismiss them as insignificant just because they are not yet threatening the very fabric of IC. Good point and they have also caused much economic pain to businesses and the French Gov’t with their protest. The “pain involved” so far is somewhat rounded error category only anyways. As they will print again and or juice out more of the value from their colonies. I hear you, as, any tiny nail into the Frankenstein corpse counts, but we are still in very first rounds of the grand finale.. I think it has great potential as an entry-level demonstration package. All you need is a gilet jaune and the feeling of disenfranchisement. So true: Spain has the highest rate of street protests in Europe, there’s always one for some thing or other. I think you right. We seem to be reaching the inflection point. +100. It would still be good to see the elites taken down a notch before we all descend into the abyss. I’M ready. I purchased several yellow vests for the Davos equivalent meeting here in Jackson hole next summer. Yep: rapid rise, fingers in many interesting pies. Even worse, ‘humanitarian of the year ‘ award from the UN……. What about QE for the people? Some kind of universal income, with of course the risk of debt ballooning on a scale never before seen followed by hyper-inflation, but what other choice is there? It would be a sort of last gasp attempt to jolt the world economy back into a GDP generating machine like yesteryear when oil was cheap and profit allowed for huge infrastructure projects like the US interstate highway system or the California aqua-duct from the Sierra’s to Los Angeles. Of course those kind of projects are no longer possible as we scrape the bottom of the conventional oil barrel, while pursuing much more expensive non-conventional oil, but you know what they say, ‘Desperate situations require desperate action.” So it would seem the CB’s will quickly decide to take the desperate measure of getting the masses lots of dough, a sort of going away party atmosphere will ensue until a dollar’s worth a millionth of a penny. Bon Voyage! See a scant few of you on the other side of the bottleneck. Here, have a bag of freeze dried food for the journey. This isn’t said in any facetious sense. QE for the proles? Are you kidding? Not going to happen. Ever. Plan accordingly. QE for the proles? I think it is possible. However, I wouldn’t get too excited. I think if that does happen, it will be done to buy a few weeks of time for the ruling class to get out of Dodge and let the system implode behind them. Another distraction, like all the others of the past 200+ years. Like a magicians sleight of hand, they slip away unscathed. But as the Labor guy finally spoke out, supporting yet another referendum on Brexit, it’s clear the whole situation is one big joke, nobody supports the Leave campaign now, only minority faction both in public and inside the political/econ class. So it will end up as predicted, UK somehow remains with at least on leg inside.. no matter how they are going to name the new condition of being partly inside the club. This is a stark quote. I agree. Our lives run on fossil fuel energy. It builds everything in sight and will for the foreseeable future. Yesterday I saw a clip of a Tesla video showing new construction of a Giga Factory. There was heavy earth-moving equipment behind the speaker working feverishly on leveling the landscape for the new building. At least 20 very large machines. Not to mention all the metal that is going into the building and all of the energy embedded in that. 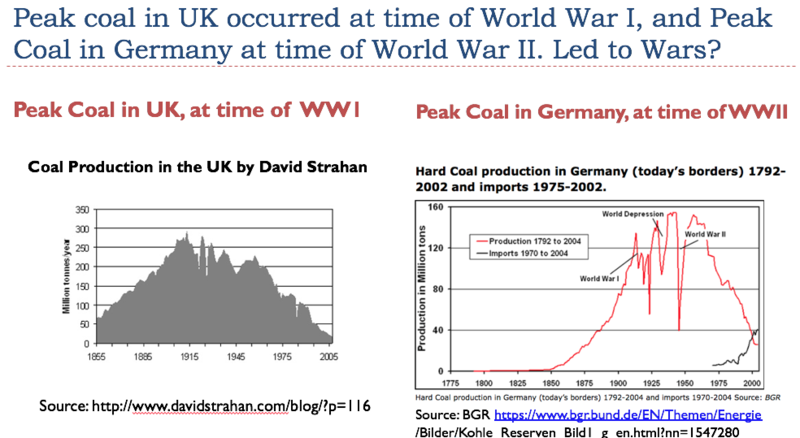 Fossil fuels make it all happen. Without them there is no “Green Energy”. “It can’t be business as usual amid constant protests, riots, shutdowns and escalating social tensions,” Klarman wrote in the annual letter to investors, according to a New York Times column filed by CNBC “Squawk Box” co-anchor Andrew Ross Sorkin. In the letter, Klarman expressed confusion at investors’ reaction to the U.S. retreat from international leadership and President Donald Trump’s Twitter outbursts. Trump scrapped plans to attend Davos due to the government shutdown, which is in its 32nd day with no clear end in sight. Klarman also warned about growing debt levels, pointing out that total U.S. government debt now exceeds GDP, a level that other countries like Canada, France, Britain and Spain are approaching. Klarman runs Baupost Group, which manages $27 billion and counts some of the world’s wealthiest families as investors, according to the Times. More warnings from prominent people. An an “even flow of resources” sounds good. However, any use of resources leads to diminishing returns. Someone will do without regardless of the economic system that is put in place. In physics there is no free lunch – unfortunately. Agree with the quote. He should have asked: are we up for it? Now, in the US, not likely, I think there are places in the EU however that will be up for it. Not that it will accomplish anything. It will just be more of a big FU. check on what happened every time. Technically capitalism has been tried many times and failed, but due to its very nature almost always rebounded. The poor usually get one good shot at rebellion, and then its back to (state) capitalism. The Soviet Union did not have very good success with this approach. Cuba is not doing all that well either. I agree. And surpluses go a long way to keep the people happy. As long as King talked and acted on race, the elites had little issue. When he started on capitalism, he ended up dead. The issue isn’t really capitalism. It is the self-organized system we live in. It cannot distribute more goods and services than are made in total. India had the caste system. This wasn’t any better. Some countries just had millions and millions of very poor people, living under a dictator. This was’t any better. Communism doesn’t adequately reward people who do work; it just uses up resources quickly. Well stated GBV. There is no “free lunch” in physics. each village had its castes, linked to various trades on different sides of the village. Looking at the regional numbers on a year-to-date basis, new home sales rose 6.3 percent in the Midwest, 4.1 percent in the West, and 3.8 percent in the South. 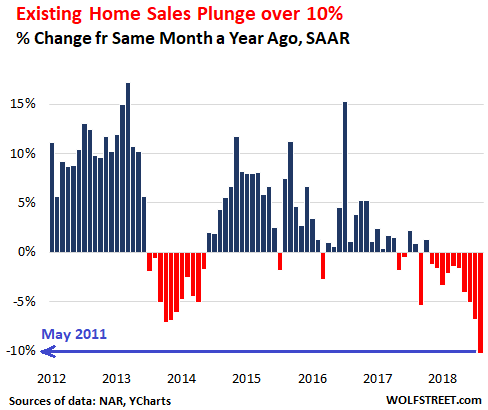 Home sales fell 17.1 percent in the Northeast year-to-date. The Northeast has a problem! Well, I suppose homes in the Northeast are overpriced too. I found another exhibit showing that the sale of existing homes in the Northeast is down as well. What little price data I found didn’t seem to show a general price problem yet in the Northeast, though. Maybe there could be a QE first time home buyers program, 1/2 of 1%, amortized over 50 years, zero down, no credit score required. Housing markets in parts of Canada, Australia, the UK, Sweden, Hong Kong and some cities in China not doing so well either. Add that to a global recession in car and smartphone sales, and we have some pretty good evidence that Gail’s affordability problem is coming home to roost. any metaphor for that reality? The house should provide energy for a human being. When the house is an energy sink, then its occupier dies or abandons it. to agree with MG, a house (or any structure for that matter) is an energy sink. For as long as you occupy the building, you have to keep pouring energy in. Heat, light, water—even paint. All those elements carry their own embodied energy, which is transmitted into the building. Then you have to input even more energy to keep the elements out. This goes on until the occupier runs out of energy (ie sells it or dies)–then someone else takes over. Kunstler, in The Long Emergency, pointed out that to keep plumbing in houses working, it is necessary to keep inside temperatures above freezing 24/7/365. I thought about that last night, when our furnace stopped working, and it got fairly cold inside (still above freezing, however). Fortunately, things are working out that we can get a new furnace today, so the problem will be solved for now. We knew the furnace needed replacing; we had already received an estimate for getting a replacement. I will still need to wear warm clothing inside for a few more hours, though. This is a small illustration of one of the problems that won’t be easily solved after collapse. Nailed it again Norm. We humans use energy to build walls between ourselves and the natural world. We fight to keep nature at bay. I meant the thing about the house providing energy in a broader sense: the house must be an energy hub, i.e. there must by some wood or coal collected in it or some pipes, wires providing energy must lead to it. The house provides energy in that way that it is an energy hub for the human being, a place for energy storage and the transformation of energy into heat and light. Once the energy stored or provided in the house is depleted or is no longer accessible (e.g. a power outage or the house is disconnected from the utilities), the house stops to be a house. Please keep in mind that there are houses and then there are Houses. It is possible to build a small long lasting superinsulated structure that collects and stores solar energy to heat the house and your water. Long overhangs keep water and sun at bay. We cook and heat with wood with gas backup, Well water with hand pump backup. LED lights with oil lamp backup. Grid electricity with solar panel backup(limited).More than 12 months food storage for us and dry forage for our livestock.Building it yourself from recycled components when possible is very cheaply done. If you are living in a Brooklyn apartment or a vinyl sided s____box in Sonoma mortgaged to the hilt dependent upon uncertain energy inputs………….you’re asking for it. 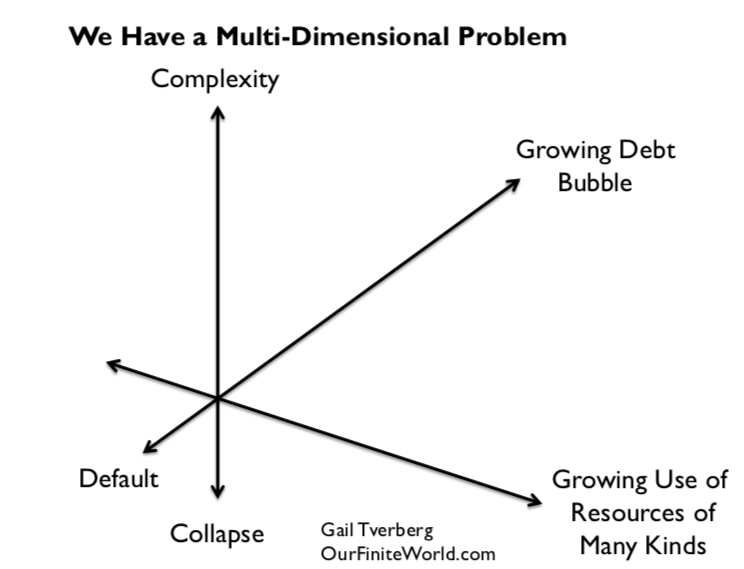 I think most of us who follow and respect Gail understand what lies ahead for the Networked interconnected hypercomplex dissipative structure we call our industrial economy. This is evident from the quality of many of the commenters who post here. Clearly we are presented with with a predicament rather than a problem as William Catton has noted. I think I would like to see less news aggregation and more in the way of intelligent responses to this predicament. Less handwringing and more thoughtful planning on how we might bring our families and neighbors to a better place. Just remember, in your small superinsulated structure that there may very well be things that cannot be replaced easily. A broken window, for example. Or a furnace or a cooling unit. A computerized system that is supposed to run the system. Banks that allow you to pay for these things. I suggest finding a church of your choice, rather than trying to do the impossible on this earth. Or else some faith-related group, that has a view of something that can be done here. Perhaps a cult of some kind. 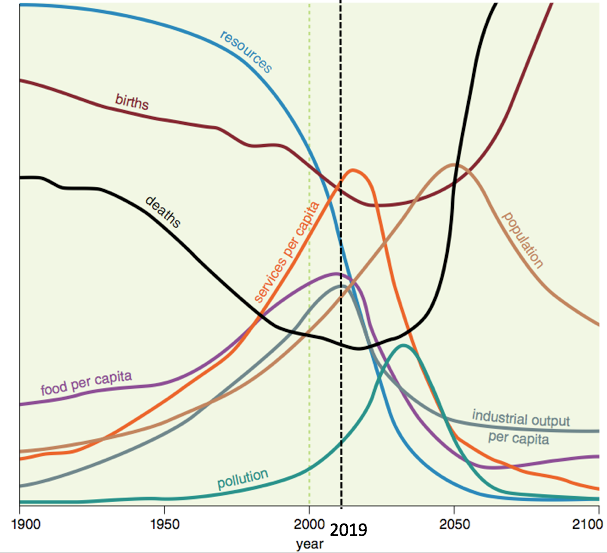 Most sustainability groups will fall apart under stress. You can’t do anything very much on your own. You need to be part of a close-knit group working for salvation on some basis. – But start looking at it as if seeing it all for the first time. This is his chart, showing how long the drop in sales had been going on, which is most of 2018. Interest rates have been rising since December 2017, when they were 4.2%. They rose to 5.2% by mid-November, then fell back to 4.75% by mid-December, according to the article. Most sales in December were bought based on November interest rates.